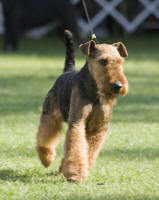 When summertime came, we decided to go to Great Western Terrier Specialty (2008) in Southern California! Michael and I loaded up our RV, drove the 3 day drive to Long Beach (with the full service generator going a lot of the time since it was so hot!) 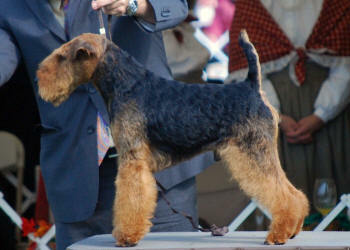 and went to the shows for the Welsh Terrier Club of Southern California. I entered him in the bred-by-exhibitor class - and as usual was up against professional handlers that specialize in terriers. Cyril was awarded Winners Dog one day by Mr. Clay Coady (terrier specialist from AZ), Best Bred-By Exhibitor in the Breed and then a Group 4 in the Bred-By-Exhibitor group! Michael and I were thrilled! Even if we were drenched in the 108F heat wave they were having! As a side note, the drive home was fun, we explored some of the California Coast (some of it was on fire, so was off limits) and then the Oregon Coast ...KSee, Cyril's mom, and our travel companion that trip, had a terrific time! 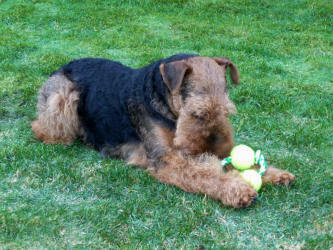 I decided to leave Cyril with my US handler team, Wood & Jenny Wornall, to condition and prepare him for Montgomery County, and the Welsh Terrier Club of America specialty in October in Pennsylvania. When I went to Montgomery to watch, Cyril looked amazing! He's a bigger dog than his brother, Robbie, but his proportions are beautiful, with a beautiful expression, lot's of bone and amazing furnishings ... beautiful red and hard enough, but not so hard that they easily break off. He definitely 'looked the part' ... and, just like with me, he acted like the perfect show dog ... very interested and attentive, yet so easy to manage (perhaps it's because he was a mature dog). Well, the judges also liked him - he won Winners Dog a couple of times that weekend and Best of Winners - which helped him win the Welsh Terrier Club of America annual award for "Best of Best of Winners"
A few photos of Michael Hotchin, at home, hanging out with Cyril and Haley ... and then one with friends over, and who's in their lap? Cyril of course! Cyril flew home with me after that show, settled right back into home life - even though he had been away for the last few months and life was as it should be ... in one of our laps, whenever anyone sat down (and I mean anyone that came to the house!). 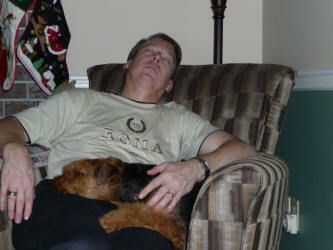 Phase III of Cyril's life began at the end of 2008! In phase I, Cyril played the role of being strictly our house dog ... phase II was when he was briefly a show dog (finished his Canadian Championship - twice(! ), then finished his American Championship -- finishing over Montgomery Weekend, at Hatboro and Devon!). 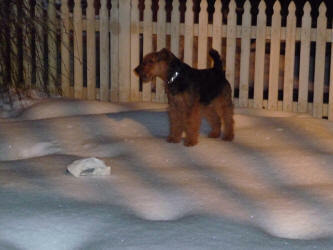 Click here to read more about how he's doing with his new family and some terrific pictures! 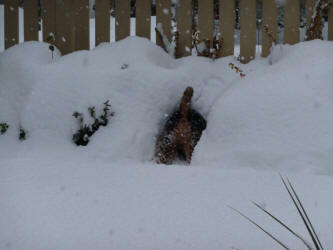 Click here for more pictures of Cyril in his new life! Michael and I are SO happy that he has such a wonderful family to call his own!